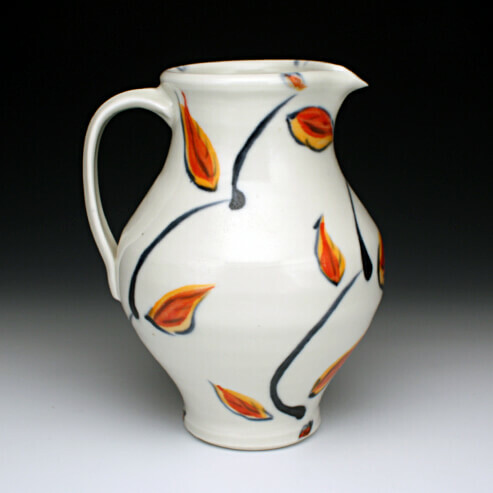 Sarah Jaeger is a studio potter in Helena, Montana. She received a BA (in English literature) from Harvard and a BFA from the Kansas City Art Institute. She was a resident artist at the Archie Bray Foundation from 1985 – 1987 and the recipient of an Individual Artist Fellowship from the Montana Arts Council. She was a United States Artists Target Fellow in 2006, and in the spring of 2007 she was one of the artists profiled in the PBS documentary Craft in America. She has taught at Pomona College, the New York State College of Ceramics at Alfred and the University of Nebraska-Lincoln and has given workshops at schools and art centers nationally. Her work is in public and private collections and, most important, in many kitchens throughout the country. Functional pots cohabit our intimate domestic spaces. We experience them with our bodies â€“ our hands and lips as well as our eyes. They can insinuate themselves into our consciousness by many different avenues even when we are not paying attention, and over time pots we use can accrue layers of meaning and association. Functional pots do not need to announce their importance. In fact I believe that it is by not being important (or segregated to a pedestal in a museum) that they can bring the experience of beauty or unexpected pleasure to everyday life. I am obsessed with making pots that convey a sense of volume, that speak of the capacity to contain and also offer their contents, that express their potential to be useful, generous, and, in a way, luxurious. I choose to work with porcelain, thought to be the most precious of clays, but which is also the most durable. Its whiteness and translucency lend a luminous depth to the glazed surfaces. I use saturated colors and often layer glazes, usually in patterns that repeat themselves loosely and with variation as they wrap themselves like skins around the volumes of the pots. I want these lustrous surfaces to attract the hand as well as the eye. I want the pots to be both elegant and easy, beautiful and friendly, capable of providing abundant nourishment to our daily lives.